Most families are riding the wave of high-tech gadgets, rarely considering its negative consequences: increased stress, connected isolation, loneliness, bad habits and behaviours and dangerous addictions. Managing Your Family?s High-Tech Habits helps you sort through the promise and the pitfalls of virtual living, showing you how to navigate social media choices and set healthy boundaries. Various chapters address hot-button issues: why boys get hooked on video games; why our daughters practically live on their cell phones; what to do when families are caught in the dark side of the web. 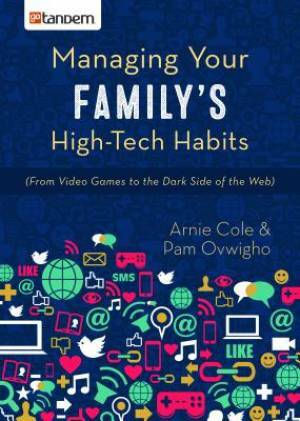 Managing Your Family's High-Tech Habits Paperback by Cole, Arnie; Ovwigho, Pam was published by goTandem (Barbour) in June 2015. The ISBN for Managing Your Family's High-Tech Habits Paperback is 9781630583736. Be the first to review Managing Your Family's High-Tech Habits Paperback! Got a question? No problem! Just click here to ask us about Managing Your Family's High-Tech Habits Paperback.